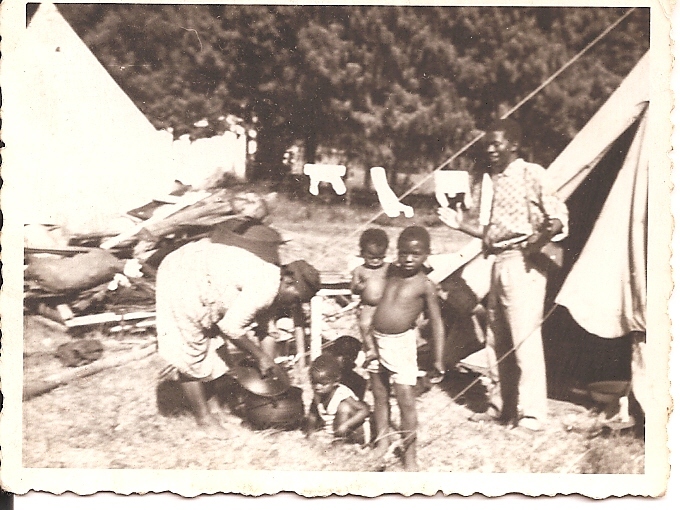 Mrs. MaZungu Khumalo (40) with four of her nine children, Thoko (3), Nomsa (8 months), Sizwe (8) and Richard (20) in front of one of the two tents near the graveyard in Vryheid that had become their home as from 13 February 1963 after their house and the whole village in nearby KwaBhanya had been bulldozed and everybody driven or carried away forcefully – some finding refuge [once more] as labour-tenants on farms – and others landing in the ‘reserves’, ‘bantustans’ – “homelands” further away. In the years in which South Africans mark the centenary of the iniquitous Natives’ Land Act of 1913, note is a timely reminder of the traumatic impact of forced removals on individuals and their families. Already the day before several neighbours had been ordered to leave and had been driven away to “reserves” far off. By sunrise white soldiers had come again on big lorries and bulldozers and demanded that the people still remaining behind evacuate the village without delay. Children, women and aged people that the squad could still find in the village were ordered to pack their belongings and load them on the lorries waiting nearby. A chaotic scene: Terrified children and screaming babies, helplessly pleading and weeping mothers, pets and poultry running in panic all over, loud voices and sounds of bulldozer-engines, flames, smoke and dust converted the once so familiar and protective home-village to hell! The armed forces, their angry faces and commanding eyes and the monstrous tracked vehicles all over left no doubt that the eviction would eventually be carried out even more forcefully. Some people got injured; greater riots, however, did not take place. Sizwe and his mother along with 5 of his altogether 8 brothers and sisters clambered on the back of the big lorry with the few belongings they could manage to rescue; then the lorry started moving. The evicted villagers still had to witness how the bulldozers advanced and trampled down before their eyes all which had been home and had meant being at home to them. The family graves on the yard, the vegetable-garden, the pets and poultry and the fruit-trees – all that had to remain behind; die once so familiar world of early childhood. Along the fence around the graveyard next to the settlement for temporary workers and labourer-families, Bhekuzulu near Vryheid, the evicted were dropped. For shelter they had to rent camping-tents from the municipal office responsible for administering displaced persons. 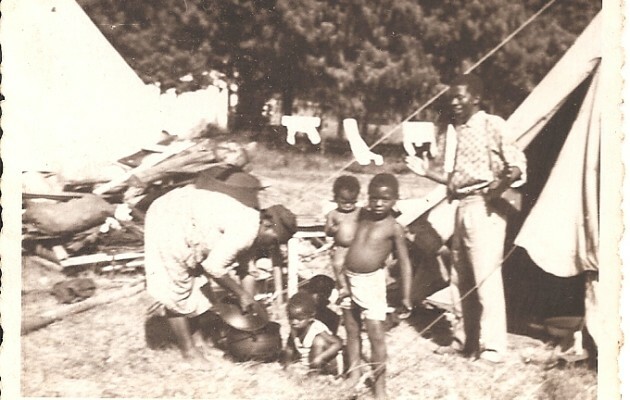 Sizwe’s mother, MaZungu, managed to acquire two tents for her household of 11 persons, although only one tent per household – no matter how big – had been stipulated. By sunset both tents had been pitched and the few belongings that could be rescued were piled together such that one could sit or lie among them in the evening. Steadfast MaZungu stood among her little flock and tried to comfort, soothe and cuddle them. Sizwe’s father , who – like almost every other black adult in Apartheid times – had to work far away from home, found his wife and children in the camp for evicted and homeless persons near the Bhekuzulu graveyard when he was some weeks later allowed to take short leave and travel home. The village KwaBhanya had been disbanded and the area where it had been thereby become „white“ – was divided among the white landowners as additional grazing land to the farms „Schaapkopje“, „Nooitgedacht“, „Welgeluk“. The “black spot” had at last been eradicated from the map; the policy of Bantustans – the homeland policy – could further be pursued. *Sizwe Khumalo passed away in July 1994. In the second year of the Anglo Boer War (My grandfather was eventually a POW and sent to Bermuda) my grandmother Hester Coetzee was arrested on their farm in the Southern Free State – the house was burnt down and all the animals killed (except a small flock of sheep rescued and taken to Basutoland by their Sotho shepherd – and brought back after the war). She and her two small children were forcibly removed, put on an open wagon with the few portable possessions she could gather and taken to the Koffiefontein Concentration camp. She lost both children and after the war they returned to nothing (except a small flock of sheep!) According to figures published in 1904 in 1901 alone, 20 000 women and children died in from a population of 100 000 in these camps… 114 years have passed since. Time heals wounds and in forgiving is freedom. to me, my mother [1922-2001] has been a good example and a helpful teacher: I saw and heard that she had forgotten not a single attrocity she and her family – including her parents and grandparents before her – had survived, but she was willing to forgive and turn a new leaf. I learnt to do likewise. My grandchildren will someday recall what I went through – for example on 13 February 1963 – and hopefully, like you today, submit: “Time heals wounds”. Thank you so much for this, Baba. What a great piece of history! It’s always exciting to see photos we have never known before. M a s h o b a n a ! It is essential that you and your generation continue learning to relate about recent history as was experienced by your parents and their generation. 13 February 1963 is one such day in our struggle and on our long walk to freedom!